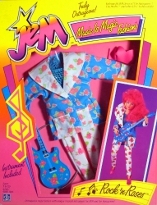 Hasbro package contents listing Includes: Jacket, pants, bandeau, T-shirt, ankle boots and guitar. 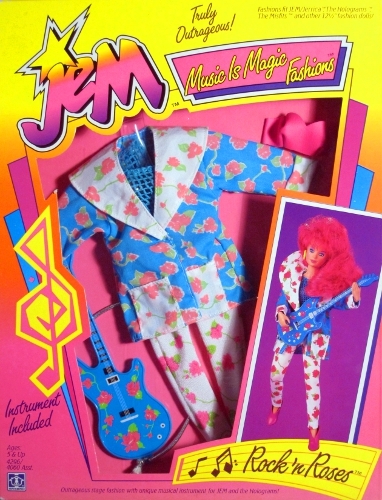 The name of this fashion is a not Jem song title. More Skip here for a listing of other depictions of Rock 'n Roses (cartoon, prototypes, catalogues, etc). 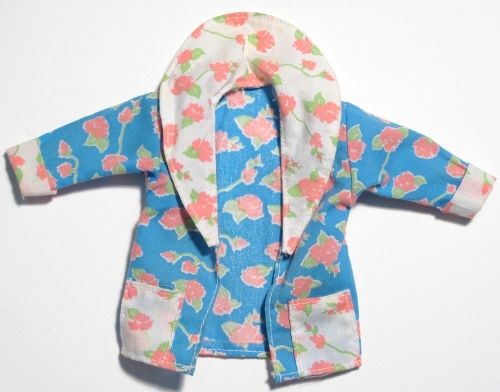 Jacket: Blue and wide jacket with wide lapels, cuffs and pockets, rose design. 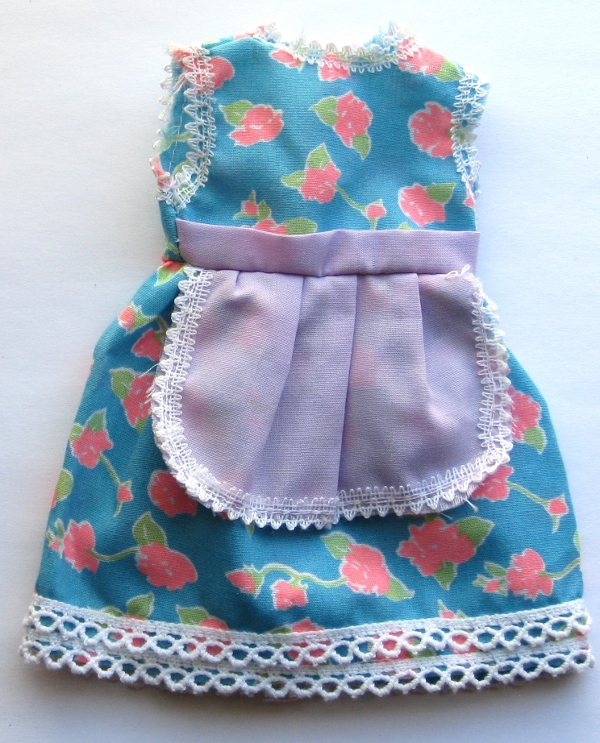 The blue floral pattern was going to be reused for other clothing pieces in 1988, according to the photos in the Hasbro Pre-Toy Fair Catalogue Matching Medley Fashions. 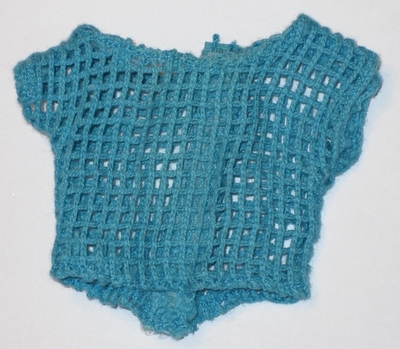 I found an unusual piece of doll clothing made of the same material. I don't know what it would have been sold with but it appears to be proportioned for a baby doll. pants: White spandex with floral design, split vertically at hems, has a separate dark pink upper waist area, elasticized. 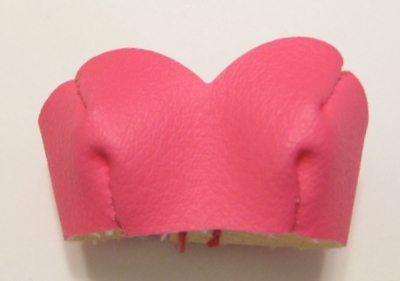 bandeau: fitted hot pink leatherette with velcro closure in back. T-shirt: Blue mesh, velcro closure in back. 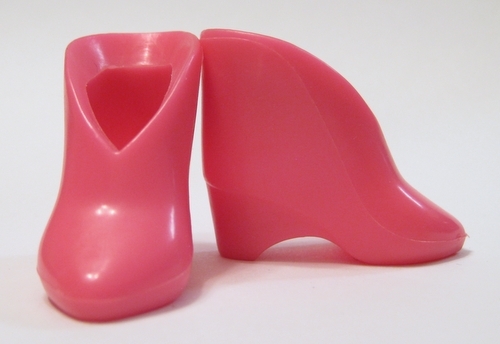 ankle boots: Dark pink, stiff rubber. guitar: blue plastic guitar with shiny rose-themed label, silver strap. has four strings and pegs, but is not listed as a bass guitar. Packaging Variants: A listing of the packaging that Rock 'n Roses can be found in, that I know of, so far! *I don't own this fashion NRFB so I can't say which, if any posters and inserts originally came with it. Bold listings are those I have used to create this ID page. Anything in Italics I haven't actually seen but have good reason to believe exists. Feel free to contribute more information and/or photos! US Issue: © 1987 Hasbro, Inc./Pawtucket, RI 02862/All Rights Reserved./Made in China. H28. I have seen two versions of this box. One has the H28 designation clear sticker, the other has it printed directly on the box. Poster - Folded Glitter 'n Gold illustrated poster H-28, with first year catalogue poster on flip side. MTV offer - unfolded, has an H-28 designation. 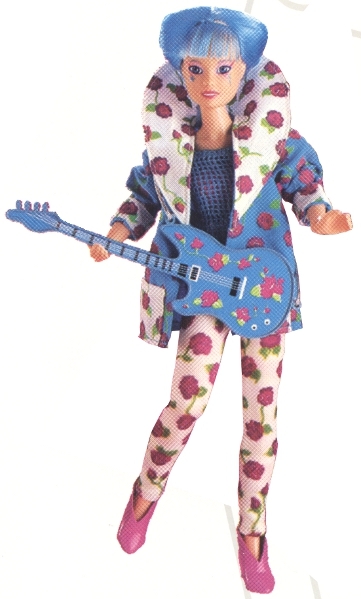 Aja in Rock 'n Roses shown here from the 1987 Hasbro Toy Fair/Dealer catalogue (US) - image has been flipped I believe! Looks like the produced fashion. Music is Magic fashion boxes. Same photo appears on the 2nd year catalogue poster. Looks like the produced fashion. 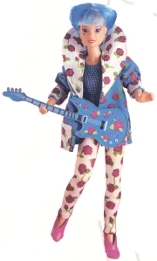 The Kimber doll is shown wearing yellow hoop earrings which were not included with the fashion. Illustrations: Cartoon Shown left is a cleaned up version of the original model cel, which can be viewed on Felicity-Chan's cel gallery. Other than the pumps being replaced by ankle boots, and the bandeau looking more like a pink undershirt, this fashion is pretty close to what the doll's produced fashion looked like. The produced fashion didn't come with earrings or hair decoration. Credits: Main doll photo, bandeau, boots and guitar photographs are from Janet's collection, photo of mesh shirt courtesy of Glamour to Divaz!